Here you will find our screw cap and slip lid tins made of aluminium. Aluminium cans are the classic cream tins/jars! 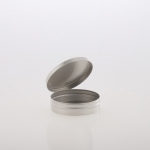 The small, round aluminium tins are especially suitable for high-quality creams, waxes, lip balm and many other filling goods. The aluminium cans are also suitable for food. Unlike cans made of tinplate, with aluminium cans there is no risk of rust due to water containing filling goods or contact with water.